The Vancouver Canucks started their much-anticipated 2014-2015 season with a win over the mighty Calgary Flames. There’s been a lot of intrigue surrounding this year’s squad, due in large part to the number of new players on the roster. Thus, ahead of game #2 – against another Alberta powerhouse – here are a few Things That Make You Go Hmmm. Is Derek Dorsett the second coming of Raffi Torres? Every time I see Dorsett on the ice, I’m reminded of former Canuck Raffi Torres. They are the same height (6’0”) while Torres outweighs Dorsett by 20 pounds or so. They play a similar style: good skaters who work hard and try to get a piece of any player in their immediate surroundings. They aren’t going to set any scoring records, but they can indeed be difference makers on a 3rd or 4th line. Dorsett has amassed over 100 penalty minutes in each of his 6 NHL seasons (except for the lockout year). He is a welcome addition to the Canucks’ 4th line given his skating ability and willingness to get messy. He could be one of the team’s unsung heroes this season. 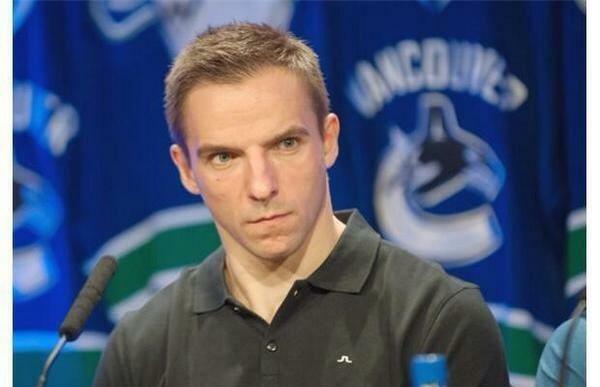 Is Radim Vrbata a secret Sedin triplet? Vrbata’s impact can’t be understated. He will help the Sedins become 70-80 point players again (getting rid of Torts and his strange deployment schemes will help with that as well). He will help resurrect the power play. And he will provide bloggers like Wyatt Arndt with funny meme material for the entire season. Will Nick Bonino live up to expectations? I know it’s early. But I didn’t really notice Nick Bonino much in the pre-season or in the opening game. There’s a lot of pressure on Bonino given that he was the centre-piece in the Ryan Kesler trade. Given Kesler’s quick start in Anaheim (3 points in his first game), the comparisons – fair or not – have already started and will continue throughout the season and beyond. If he can give the Canucks a reliable pivot for its 2nd line and its 2nd power play unit, then he would have done his job. I think 40-50 points is a reasonable expectation for the newcomer. And if makes other players like Burrows, Kassian, and Higgins better, then that’s a bonus. Have we already found our new whipping boy in Luca Sbisa? Whereas Nick Bonino has gone relatively unnoticed, the same can’t be said about Luca Sbisa. And unfortunately, it’s not necessarily for good reasons. He’s already offered up a few juicy turnovers (pizza anyone?) along with some inconsistent play early. It might be the function of a new team, new teammates, and a new system. Or perhaps he’s just not that good. Look for him to battle Frankie Corrado and Yannik Weber all season for the 6th defencemen spot. Where will Linden Vey end up playing? We’ve already seen Linden Vey play in the middle and on the wing on the 3rd line. As a centre, he’s able to use his speed and his strong stick-handling. But his lack of size may cause match-up problems on the road, especially against the deeper teams. On the wing, he can still use his speed but he won’t have the puck as much. And if the team wants to give Bo Horvat a good look at centre, then Vey might get pushed to the wing by either Shawn Matthias or Brad Richardson. We’ll see what happens. How will Ryan Miller handle the pressure? Our new pivot has tried to downplay the pressure (from fans and media) of playing in this market, suggesting that it’s the same in every NHL city. I guess he hasn’t really paid attention to the last two seasons here. It will be interesting to see if Miller is able to get back to the 2009-2012 Ryan Miller where he was registering 5 or 6 shutouts per season. And there’s a certain fan favourite back-up willing to step in at the drop of a dime.